In a year when immigration issues have figured prominently in primary elections, the University of Texas/Texas Tribune Poll finds voters — particularly conservative voters — taking a hard line. 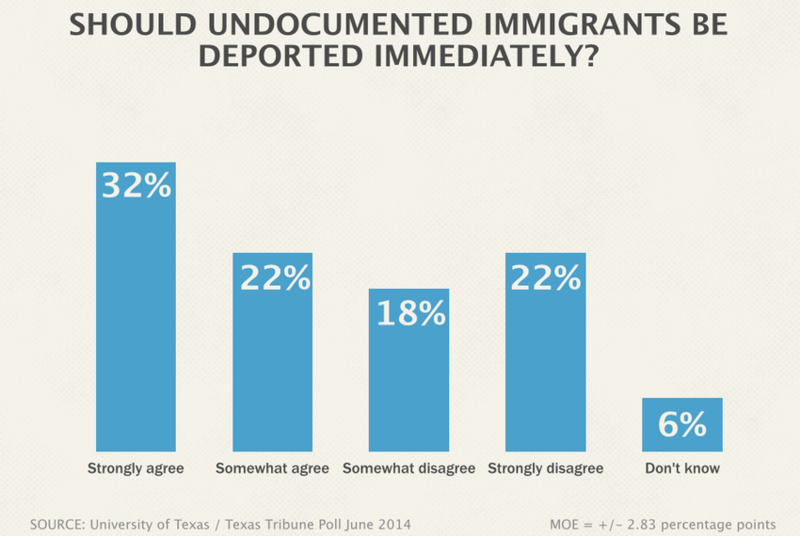 A slight majority of Texans say undocumented immigrants in the U.S. should be deported immediately, according to the University of Texas/Texas Tribune Poll. 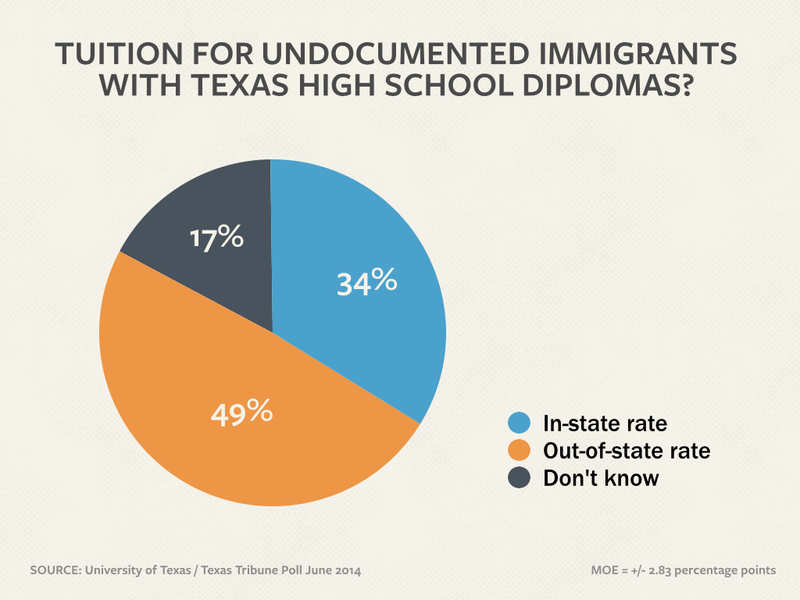 Nearly half say that undocumented immigrants should pay out-of-state tuition at state schools even if they graduated from Texas high schools and have lived in the state for at least a year. The partisan lines are similar when it comes to tuition, with 54 percent of Democrats saying those undocumented immigrant students should get in-state tuition, while 58 percent of Republicans and 82 percent of Tea Party voters say they should pay the higher out-of-state rates. Only 34 percent of Texas voters agree that “most immigrants pay their fair share of taxes,” while 56 percent disagree — 40 percent of them strongly so. A large majority — 73 percent — agree that “we should restrict and control people coming to live in the U.S. more than we do now.” Half of the voters strongly agree with that statement. “This tells us a lot about the continuing power of immigration and border politics in Texas,” said Jim Henson, co-director of the poll and head of the Texas Politics Project at UT-Austin. Texas voters’ disdain for the Affordable Care Act remains strong, with only 31 percent saying they have a favorable view of it and 58 percent saying they have an unfavorable view. The strongest opinions are even more lopsided, with 50 percent saying they have a “very unfavorable” opinion of the federal health care law and only 16 percent saying they have a “very favorable” opinion. 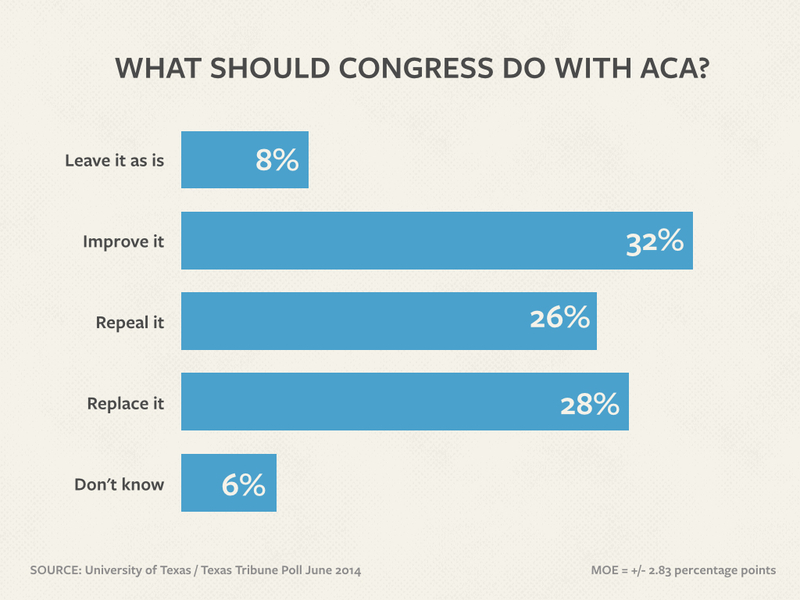 That said, only 26 percent would repeal the law and do nothing to replace it. Only 8 percent would leave the law as is, but 32 percent said their member of Congress should work to improve it and 28 percent want Congress to repeal it and replace it with something else. Henson said the numbers indicate a concern about the problem without suggesting a solution to it. Voters seem to agree, he said, that health care needs to be addressed in some way. And he pointed to one unusual result in the poll — a reminder that the sponsor of the reforms, and the reforms themselves, are very unpopular with one part of the electorate. This is one of several stories on the latest University of Texas/Texas Tribune Poll. Thursday: The statewide general election races and a peek at the 2016 presidential primaries. Friday: Texans’ views on various officeholders and candidates, on the state of the state and the country, and on the Tea Party. Monday: Which major party candidates for governor would do a better job on big issues, and most important problems facing the state and the country. Yesterday: Texans’ views on a variety of education issues. Also today: Texas voters on a range of social issues.